From picture books to nonfiction to young adult thrillers, there is a Best of 2013 children's book for readers of every age. Colby Sharp and Donalyn Miller, from the Nerdy Book Club blog, sum up a fantastic year of children's and young adult literature. Enjoy this list of outstanding 2013 books that your children (and you) will love to read. Think about what would happen if you gave a Little Golden Book and a Sharpie to Rambo. Battle Bunny is what you’d get. 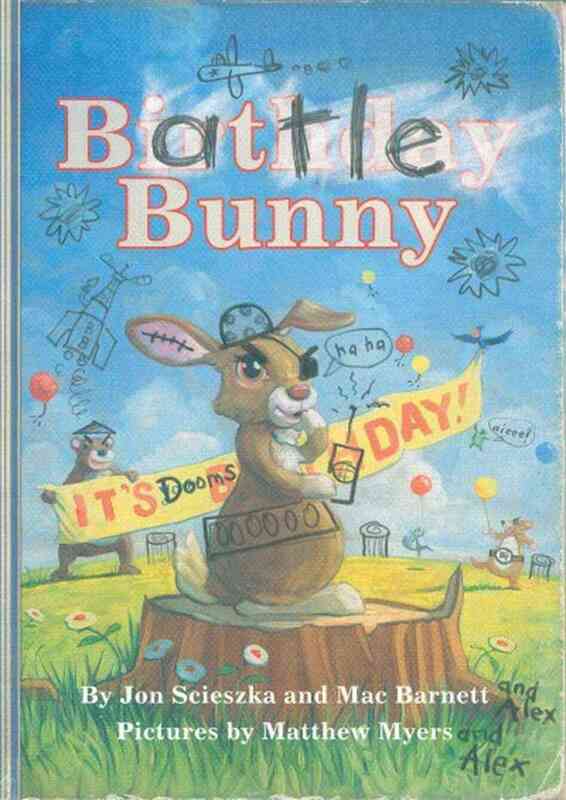 The book starts out as a sweet story about a bunny celebrating his birthday...then Jon, Mac, and Matthew start crossing out and changing words and adding doodles to transform the book into Battle Bunny, a story of a bunny bent on world destruction. It’s the perfect book for kids that are into building or destroying (or both). Mr. Tiger’s life is pretty drab. What happens when he learns to live on the wild side? Mr. Tiger Goes Wild is the perfect book for the young eccentric reader or uptight dreamer. If you combined Harold and the Purple Crayon with The Never-Ending Story and shot it up with steroids, out would pop Aaron Becker’s Journey. This amazing wordless picture book will take readers on a journey that will show them that all things are possible with a little imagination. Please, please, please buy this for the kid who is always saying they are bored. Did you know that caribou sprout up to 10 pairs of antlers in a lifetime? This marvelous book uses biology and math to explain the amazing things animals accomplish. A delightful read for the little future park ranger or mathematician in your life. Fish lives life on the edge. Snail is timid and nervous. But, not wanting to be left behind, Snail must face his fears and decide whether or not he is ready to come out of his shell. The Story of Fish & Snail has been used in classrooms across the county to help empower students to be brave. Looking for a book that both the wild and mild child will enjoy? The Story of Fish & Snail has got you covered. In a magical world where the magic is fading, the unlikeliest hero may need to step in and save the day. The Real Boy shows us that it is possible to find magic in the most unlikely places. Best for children who lean toward the fantastical. When the only family she has ever known dies in a tragic car accident, 12-year-old genius Willow Chance teaches us to believe in a broken yet magical world. Counting by 7s is a great book for readers young and old who are looking to see the beauty in a messy world. In this fractured fairy tale, Liesl Shurtliff shows us her "truth" behind the popular story of Rumpelstiltskin. Rump: The True Story of Rumpelstiltskin is a wonderful book for the child in your life who likes to make up their own rules. What if our childhood games and fantasies were real? When is childhood over? Three best friends, Poppy, Zach, and Alice — on the edge of adolescence — set off on one last adventure in answer to a dead girl's wishes. Beautifully written, Doll Bones makes a riveting read for the child you know isn't scared of being a little scared. Two raccoon swamp scouts, Bingo and J’Miah, must wake the ancient Sugar Man when danger threatens their home. Kathi Appelt’s lighthearted tone and playful language will delight readers who hold a special place in their heart for the swamps of Texas and the creatures who live there. Ruby Pepperdine believes that she can right a terrible wrong if she makes a wish during the annual Bunning Day Parade. Urban understands that kids have lots to worry about in their lives, and this book will make a great read for any child trying to make sense of life. Eleanor and Park, two high school misfits, fall in love one song lyric and comic panel at a time in this relatable and honest book. It's set in 1986, so parents and teenagers alike will recognize the pop-culture references — but will most likely need a Kleenex bookmark too. The perfect book for young, music-loving romantics. Haunted by the ghost of Jacob Grimm, Jeremy and his daring friend, Ginger, investigate the strange disappearances of local children in their town, Never Better. Rich with allusions to classic tales with a modern horror twist, Far Far Away is the perfect read for the young teen who spent their childhood reading The Brothers Grimm. Assisted by his imaginary friends, Mr. Furrington, Jesus, and Scowler, Ry Burke saved his mother and younger sister from his abusive father years ago. When his monstrous father escapes from prison and heads for the family farm seeking revenge, Ry must call on his childhood protectors to help him once again. Horrifying and dark, Scowler is reminiscent of Stephen King at his best — making it the perfect fit for a teenager looking for a well-written story that is ultimately hopeful in spite of the murder and mayhem. After a stupid stunt last school year, 14-year-old Ryan Dean West is assigned to Opportunity Hall, the dorm for troublemakers at the exclusive Pine West boarding school. Brutally honest, funny, and heart-wrenching in turn, teens will connect with Ryan Dean and his classmates as they struggle with self-identity and moving into young adulthood. Winger is for the young scrapper with a heart of gold. A tour de force for Jenkins and a must-own for animal lovers. Beautifully illustrated with Jenkins' signature cut paper art, The Animal Book includes an encyclopedia of animal facts — grouped into categories like "Defenses" and "Animal Extremes." It includes pages of additional animal facts, a glossary, and a fascinating timeline of Jenkins' writing process; little botanists and artists alike will fall in love. Tanya Lee Stone recounts the little-known story of the 555th Parachute Infantry Battalion, an all-black paratrooper unit that fought during World War II while enduring racism and segregation. Well-researched and engaging, this book will be a fascinating read for history buffs of all ages. Everyone’s favorite amoeba is back, and this time he’s caught video game fever. Will video games take over his life? You’ll have to read Game On! to find out. If you’re looking for the best book to buy the Call of Duty–obsessed reader in your life, Squish 5: Game On! is the book you're looking for. Have you ever wondered how Star Wars characters spent their middle school years? Jeffrey Brown has answered that question for you in Star Wars: Jedi Academy. The humor and awkwardness that you’ll find in the pages perfectly captures middle school life for any young Jedi. We’ve all heard the story of the Donner party and their insane (and doomed) trip across the country in the 1840s. Nathan Hale manages to tell the tale in a way that will captivate, educate, and gross out middle-grade readers. A splendid choice for picky eaters everywhere. Donalyn Miller is a teacher in Fort Worth, Texas. She is the author of The Book Whisperer (Jossey-Bass, 2009) and Reading in the Wild (Jossey-Bass, 2013). Donalyn co-hosts the monthly Twitter chat #titletalk (with Nerdy co-founder Colby Sharp) and facilitates the Twitter reading initiative #bookaday. You can find her on Twitter and her website, or under a pile of books somewhere —happily reading. Colby Sharp is a third-grade teacher in Parma, Mich. He blogs at Sharpread and helps out at Nerdy Book Club.